Can God Trust You With True Riches? 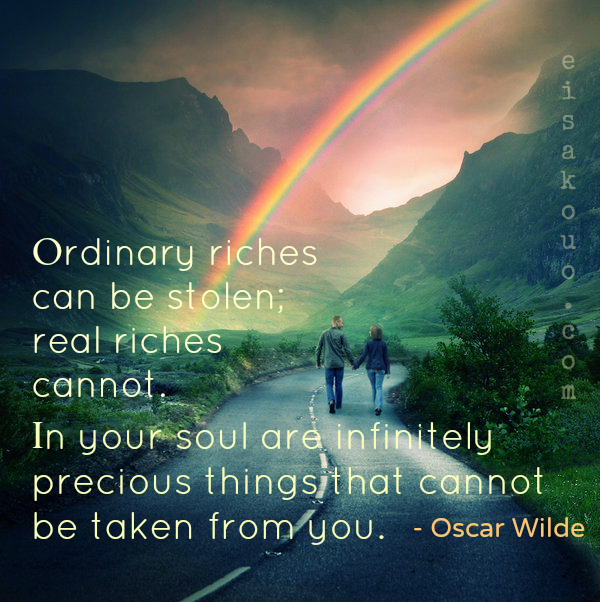 I have been thinking a lot lately about true riches. Jesus coined the phrase in Luke 16:11-12. Lets face it… riches in general (worldly riches) are mainly where our minds dwell. The good news is we don’t have to stay in this place. God has a plan to move us into the next level… into handling true riches. The main reason God gives us worldly wealth is to test us. The Lord wants to see how well we manage this kind of wealth (mammon), before He blesses us with true riches. Has God allowed you to handle a little worldly wealth or mammon yet? Mammon was the Canaanite god of riches. So in the Lord’s plan, if you cannot handle a Canaanite god’s riches, how will you handle His real riches? If you are trustworthy with a little thing like money, God knows you can be trusted with a heaven’s true wealth. True riches have nothing to do with money per se. They do include spiritual blessings like peace, security, and strength. They also include bigger words, special revelations, and deeper truths. These are so valuable they can’t be bought at any price. This is where tithing comes in to play. It proves to the Lord we trust Him with our worldly riches. Sometimes people say, “If I was making a million a year, I’d be happy to give God 10% of it.” The truth is if you are not tithing on $10,000, or $20,000 or $30,000 a year, what makes you think God will trust you with a million dollars? It’s not about tithing, it’s about trusting. The problem with many believers is they give God their “leftovers” instead of their “first-fruits.” They pay all their other bills and if they have anything left over, God gets a tip. God knows the difference between a tip and a tithe. The real issue is not whether God is trustworthy–it’s whether or not we are trustworthy in managing God’s money. Do you want God to trust you with more than you are managing right now? Prove it… because God wants to bless you with the true riches of His Kingdom.